Aiseesoft iPhone Video Converter for Mac is a professional Mac iPhone Video MP4 Converter, which can convert MPG, MPEG, MPEG2, VOB, MP4, M4V, RM, RMVB, WMV, ASF, MKV, TS, MPV, AVI, 3GP,3G2, FLV, MPV, MOD, TOD and other popular video formats to iPhone MP4 on Mac. The best iPhone video converter for Mac also can convert audio file to iPhone MP3, M4A, etc., on Mac. ...... It contains kinds of default settings which work really well. Also you can set the values you want about the bitrate, frame rate, resolution and other parameters. You can also pick up any part of the video to convert, crop the video to get your own play region and remove the black edges and you can merge two or more video files into one output file. 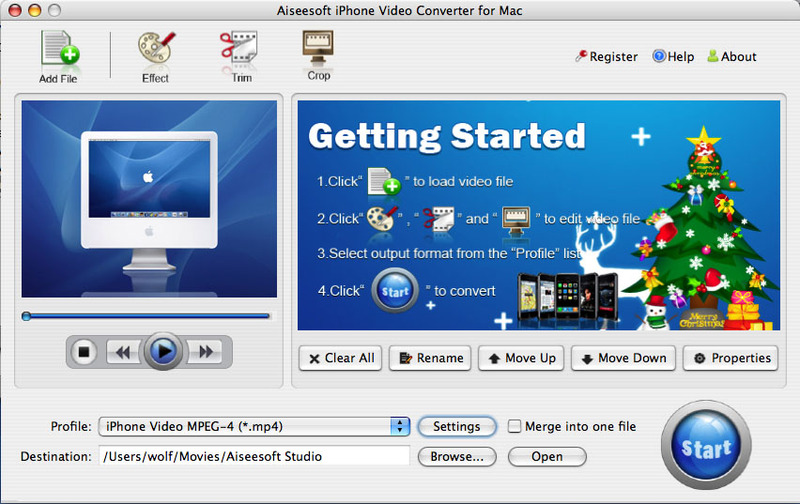 Aiseesoft iPhone Video Converter for Mac can convert almost all the popular video formats such as MPG, MPEG, MPEG2, VOB, MP4, M4V, RM, RMVB, WMV, ASF, MKV, TS, MPV,AVI,3GP,3G2,FLV,MPV,MOD,TOD,etc video to iPhone supported MP4, H.264, MP3, AAC, M4A formats on Mac. Aiseesoft iPhone Video Converter for Mac can extract audio track from video file and convert them to MP3, AAC, AC3 and other audio files supported by iPhone. Powerful Mac iPhone Converter to convert video/audio on iPhone for Mac. Qweas is providing links to Aiseesoft iPhone Video Converter for Mac 3.2.20 as a courtesy, and makes no representations regarding Aiseesoft iPhone Video Converter for Mac or any other applications or any information related thereto. Any questions, complaints or claims regarding this application Aiseesoft iPhone Video Converter for Mac 3.2.20 must be directed to the appropriate software vendor. You may click the publisher link of Aiseesoft iPhone Video Converter for Mac on the top of this page to get more details about the vendor.